Is your thatched roof weather damaged, leaking or tattered from pesky wildlife, and in need of some TLC? Aarons Outdoor Living can revitalise your hut and have it looking like new again. Our team of re-thatching specialists are fully equipped to provide maintenance or a complete re-thatch to your hut, gazebo or pergola. And better still, in the majority of cases, you can claim the cost of your rethatch on your home insurance policy! 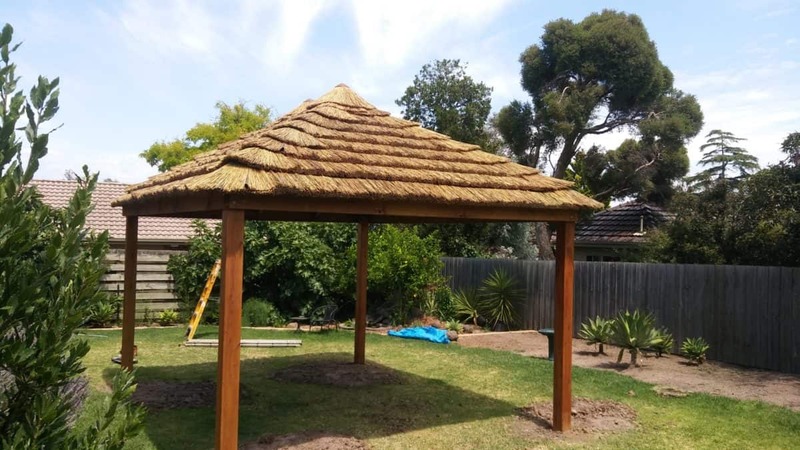 Don’t trust any general handyman – ask the market leaders to transform your thatch with a long lasting, durable, quality finish that will last many years to come. Choose to rethatch in our quality, white string, Alang Alang Bali Grass or African Cape Reed tiles. Thatching is unique in that it both cools and heats. During the hot summer months, it maintains a daytime temperature that is lower than other roofing that doesn’t allow much air to pass through (such as tin, corrugated iron, roof tiles etc). You can even drop the temperature further by wetting your thatched roof, which will then provide an evaporative cooling effect. 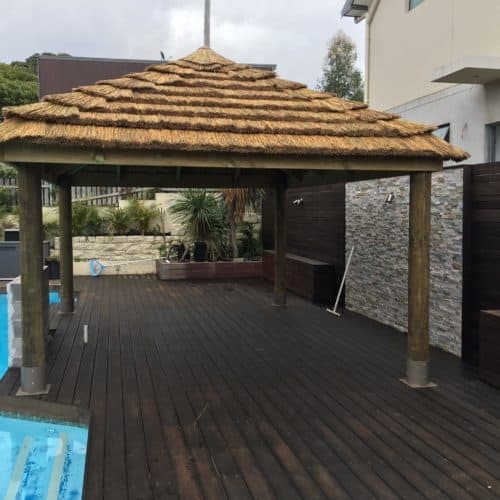 So if you have an existing outdoor area that needs a new roof, before you consider replacing it with the same product, consider replacing it with thatching. And apart from the practical reasons to re-thatch, a re-thatch will enhance the appearance of your backyard. If you are wanting to sell your home, invest in a re-thatch to reinforce to potential buyers why your home is the perfect one for them. On the other hand, you might have moved into a new home that features an existing hut, that by re-thatching, will reinvigorate your new backyard, so that your family can begin making memories in your new outdoor living space. 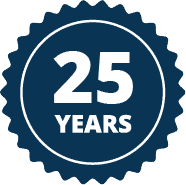 Quality thatching, like the options we offer at Aarons Outdoor Living, is designed to last a long time, but unfortunately, nothing lasts forever. Eventually, even the best thatching is going to need replacement. When that time comes, our experts are available to help you get your backyard looking great again, which you and your family deserve. So contact your local store with the details of your current thatch hut, including internal & external photos and dimensions of the roof that needs repair. Aarons will then happily forward a detailed quote for your consideration, or which can be forwarded to your insurer. Aarons Outdoor Living can look after everything for you. We will complete and send quotes to your insurance company, replace or repair your thatch, clean up and dispose of all debris and leave you with nothing but a smile. 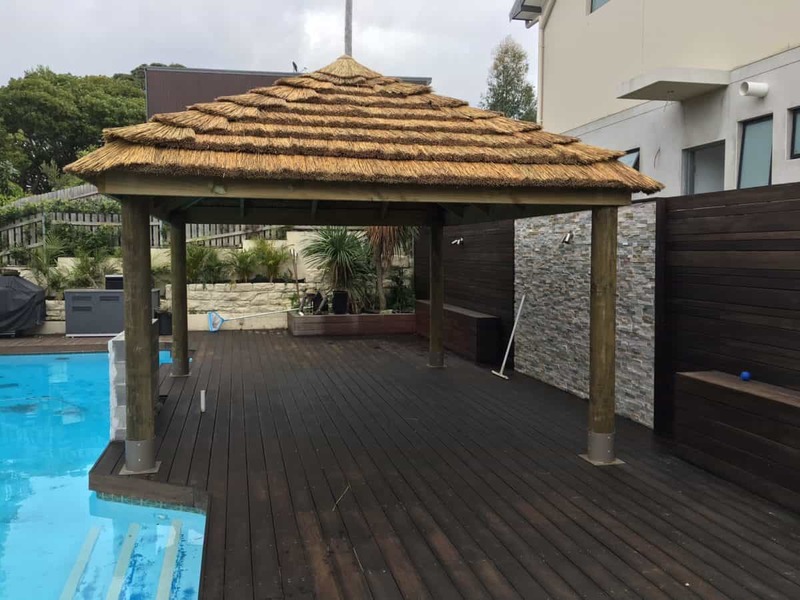 Aarons are recognised by all insurance companies, and having replaced hundreds of thatches over the last 20 years, you can be assured that you will receive the best product and service from Aarons Outdoor Living. We offer a comprehensive delivery and installation service with our team of professional installers. Submit a product enquiry below to gain an installation quote based on your thatching size and location. Alternatively, we do supply instructions for D.I.Y. installation. You don’t want to leap into a renovation project of any kind, and we don’t want you to have to. Take a look at some the questions we are frequently asked to see if they address any of your concerns. How long does thatching last? Can I remove the existing thatching myself? While removing the thatching yourself can be something of an undertaking, it is something that you can do if you wish. If you decide against doing it yourself, our skilled experts will be happy to take care of the job for you. Do I absolutely need to rethatch my roof, or is the benefit just cosmetic? It is true that rethatching will have your outdoor area looking gorgeous, but that isn’t the only reason to get it done. A rethatched roof will keep the structure in tip top shape so that you can enjoy a cosmetically beautiful, and foundationally sound hut for many years to come.